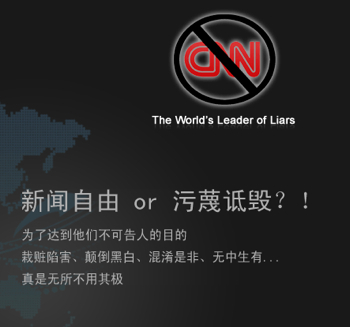 CNN's bureau in Beijing has been deluged in recent days by a barrage of harassing phone calls and faxes that accuse the organization of unfair coverage. An e-mail to United Nations-based reporters purportedly from China's U.N. mission sent an Internet link to a 15-minute state television program showing Tibetans attacking Chinese in Lhasa. A slideshow posted on YouTube accused CNN, Germany's Der Spiegel and other media of cropping pictures to show Chinese military while screening out Tibetan rioters, or putting pictures of Indian and Nepalese police wrestling Tibetan protesters with captions about China's crackdown. Though of uncertain origin, the piece at least had official blessing, with excerpts appearing on the official English-language China Daily and on state TV. Many of the examples of Western media anti-China bias posted at anti-cnn.com hone in on a series of agency photos that ran in various Western news outlets which were mislabeled as Chinese police arresting Tibetan protesters, when they are actually Nepalese or Indian police arresting exiled Tibetan protesters. Roland has been tirelessly documenting the conversation about the Tibet riots taking place on the Chinese Internet. He points out that RTL news in Germany has apologized for mis-reporting Nepali police violence as Chinese police violence, and that German station NTV is reviewing its coverage after similar mistakes appeared in their broadcasts. Also be sure to read Roland's post When Helping Becomes Hurting to see how Western protests are playing not only in China but amongst many Chinese around the world, who have unfettered access to Western media from outside the "Great Firewall." Meanwhile with videos such as "Riot in Tibet: True face of Western media" and "Tibet Was, Is and Always Will be a Part of China" getting over 700 thousand and a million views, respectively, at the time of this writing, YouTube has been unblocked in China, though as the Shanghaiist points out access can be shaky at times. The BBC English-language website is also generally unblocked. Perhaps the Chinese government is feeling a little less worried lately about losing public support? Perhaps they are less worried that people will turn against the Communist Party after reading something in the Western media, now that it is no longer fashionable in many circles to believe what the Western media reports? 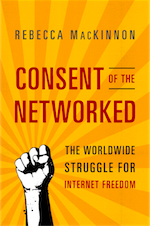 It is also worth pointing out that alternative views - though not as loud - do exist in Chinese cyberspace. Lian Yue wrote the other day that the only way to prevent more violence is to allow the press to freely report in Tibet. Memedia also points out that some Chinese netizens have been spreading some fake news themselves - such as this blog post claiming that there was recently a Tibetan terrorist bombing in Chengdu, but using victim photos from a 2005 incident in Fuzhou. The Memedia editors observe that the Tibet issue has become like the South China Photographs incident: "An issue that originally is seen through simple logic, but through the course of debating it people start considering much deeper questions." Hopefully most of China's netizens will draw the obvious conclusion: that in the end you shouldn't trust any information source - Western or Chinese, professional or amateur, digital or analog - until and unless they have earned your trust. Addendum: Somebody e-mailed me this report from the Toronto Star containing chilling eyewitness accounts from Canadian tourists who were in Lhasa for the worst of the violence. "US Internet giant Yahoo! denied Saturday posting on its websites pictures of 19 people wanted by the Chinese authorities for protesting in the Tibetan capital Lhasa." Sinobyte reports that YouTube is unblocked but Tibet-related pages still appear to be - thought it's unclear with or without Google's assistance. Gmail confirmed to be problematic using "http' but working fine if you use "https"
"China's Alibaba Group is seeking investors to buy the 39 percent stake in the Internet company held by Yahoo Inc, a person with direct knowledge of the situation said on Tuesday..."
Roland has a roundup of info on the "most wanted in Tibet" photos making the rounds of the Chinese Internet, and points out that Yahoo! and other Western-owned/invested portals are in a tough spot. 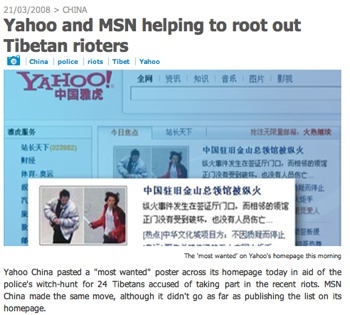 Yahoo China pasted a "most wanted" poster across its homepage today in aid of the police's witch-hunt for 24 Tibetans accused of taking part in the recent riots. MSN China made the same move, although it didn't go as far as publishing the list on its homepage. The report does not say what time the screenshots were taken. As of this writing, neither Yahoo! 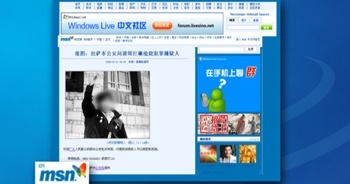 China nor MSN China are running the "most wanted" information anywhere that I have been able to find. (If anybody does find it in some corner of those sites where I've failed to look please let me know.) Did anybody else see this material on Yahoo! China and MSN China, or have a sense of how long it was there? I wouldn't be surprised if the local editors just automatically ran it because everybody else in China was running it, then got over-ridden by management in the U.S. who realized how badly this would play outside of China... Such is the disconnect between China and the West on the Tibet issue. Interesting note: France24 Observers is run by the former head of Reporters Without Borders' Internet desk, Julien Pain. Here is a video of him describing the project. "He made the observation that China has historically lacked a “public sphere” — that is, a social space where ordinary citizens to discuss issues and form public opinion. The Internet in China, despite censorship, has filled much of this need.."
Jeremy Goldkorn at Danwei reports that China's State Administration for Radio Film and Television (SARFT) has included Chinese YouTube clone Tudou on list of 35 "slightly unhealthy" a websites that will be punished and fined. He points out: "None of Tudou's real competitors like Youku.com or 56.com are on the list: the rest of the websites mentioned are small and unknown players." SARFT has also published a list of 25 "extremely unhealthy" websites ordered to be shut down. He observes: "all the websites in the list seem to be fly by night video downloading BBS and small, relatively unknown video sites. Many of them have names that imitate other, more popular websites, e.g. Xunleicn.com whose name is ripped off from the popular Xunlei.com." Jeremy concludes: "Despite being named on a list of insignificant and mostly lousy websites, this seems like good news for Tudou, as long as the fine is not too severe." Certainly beats being shut down, which was recently rumored to be Tudou's impending fate. Users of Tudou.com have noticed an uploading slowdown since Tudou shutdown its site for a full day on March 14, reports 21st Century Business Herald. According to users quoted in the report, the entire process from video uploading to publishing now takes about 24 hours. After the temporary closure, Tudou recommenced user-generated content uploading on March 17. Filters at Tudou.com competitor Youku.com can publish videos within half an hour after uploading, according to Youku CEO Victor Koo. Interesting. So I guess they're taking extra precautions to vet everything before it gets published. So the question is: does Youku have better censorship technology, more staff to handle content control, better official guanxi, or some combination of the three? "The state of the American news media in 2008 is more troubled than a year ago. And the problems, increasingly, appear to be different than many experts have predicted..."
The Chinese system of Internet censorship and media propaganda may have a lot of holes, but when tested by events like the Tibet unrest this past week, so far it's holding up well enough for the regime's purposes. For those living in the West who didn't realize that there's little sympathy for Tibet independence among ethnic Chinese in the PRC, this blog post on Global Voices will be a shocker. John Kennedy has translated chatter from Chinese blogs and chatrooms that generally runs along the lines of: those ungrateful minorities, we give them modern conveniences and look how they thank us... where have we heard this before? Reuters has a roundup on the Washington Post that begins: "a look at Chinese blogs reveals a vitriolic outpouring of anger and nationalism directed against Tibetans and the West." Of course, pretty much anything presenting more nuanced views that don't show the Chinese government actions in a good light are censored anyway. YouTube is of course blocked again. Bloggers are reporting that many BBS and chat channels are being closed or cracked down upon, and that mobile SMS's coming from or about Tibet are being heavily filtered. "Davesgonechina" at the Tenement Palm blog has been translating the chatter coming from Chinese netizens on Fanfou and Jiwai - Chinese versions of Twitter. Click here, here, and here, specifically. 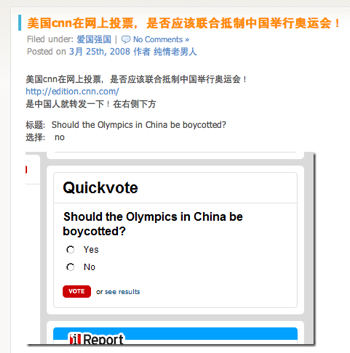 Then you ought to put some energy into communicating directly with Chinese netizens about the problem. For years now I've seen alot of Chinese netizens discussions be completely ignored or simply missed by English-speaking netizens, who too often think that Chinese netizens are all completely brainwashed. Well, guess what? Some of them think you are too. Instead of dismissing each other as fools, how about we try to talk? So I say, Tweet Back! Tweet in English, alot of Chinese people know some. If you know Chinese... what are you waiting for? This is the perfect opportunity for Tibet internet activists like Oxblood Ruffin and concerned netizens everywhere to engage Chinese people on the Internet in discussions about what is going on. As I previously outlined in a primer to engage Chinese people, these are channels where one can register a free account and launch dialogues with Chinese individuals about Tibet. Many of the people I've included below are neither kneejerk nationalists or xenophobes, and some of them know some English too. It wouldn't hurt to try. You can respond by clicking on the username link at the beginning of each tweet, sign up, and talk back. Watching the build up to the Olympics has been, for me, like watching the world's biggest, slowest traffic accident. For a while now its been pretty obvious that alot of contentious issues about China were going to come to the front as we approach August 8th, but the problem is that there are two completely separate parallel worlds on these issues: the Chinese one, and the rest of us. Westerners have been exposed to rhetoric and information about Tibetan discontent, Darfur's international and Chinese dimensions, and of course old chestnuts like Tiananmen provide a larger context of long term, ongoing problems. Meanwhile, Chinese mainlanders by and large have no knowledge of these events or issues. While for the rest of the world the Olympics will be largely a referendum on China's ability to deal with what everyone else has talked about for years, for Chinese citizens it will be about China winning a beauty pageant of sorts. 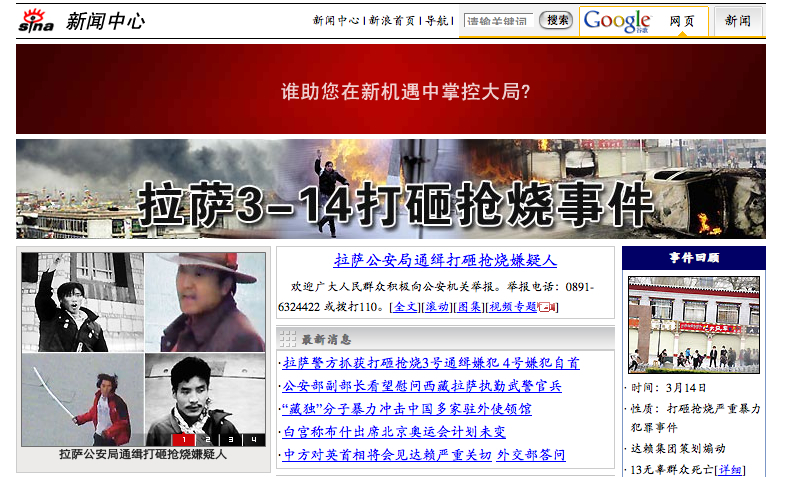 The China Digital Times has been doing a fabulous job of aggregating both professional and amateur reports from Tibet. Here is a collection of mobile phone photos they linked to, for instance. Roland Soong translates a first-hand account from a Chinese person in Lhasa. He also has a long update today including links to contrasting YouTube videos that paint different pictures of what's happening. Will at Imagethief has some astute observations about how Chinese government messages that work well on domestic audiences often don't work well on foreigners, but he points out that the Chinese official communications strategy is getting more sophisticated. As Roland also points out, romantic fantasies and propaganda about Tibet aren't exclusive to any one side. Perhaps it's time to go re-read Orville Schell's book Virtual Tibet. Very interesting blog post from NYT reporter Saul Hansell who believes that blogging has provided a valuable extension for many Times reporters' work and enables them to have conversations with their readers not possible before. "British statesman Winston Churchill once described the Soviet Union as "a riddle wrapped in a mystery inside an enigma." Some analysts say that's an apt way to describe the Chinese government's policy toward blogs." "A leading media watchdog accused a United Nations agency of "grovelling" to authoritarian governments by dropping sponsorship of a free speech day on Wednesday."